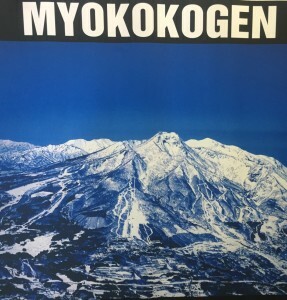 Myoko Kogen, not somewhere internationally famous, a network of snow resorts on mainland Japan on the Niigata prefecture side of the Niigata-Nagano border. 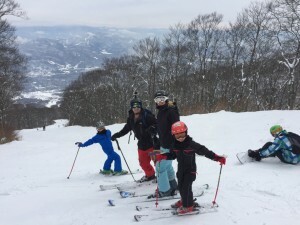 Surrounded by better known snow resorts of Nozawa Onsen, Shiga Kogen and Hakuba, we travelled here on a recommendation of one of our group who had been here before. It is a mainland resort, therefore one less domestic flight to Japan’s top island, and less time hanging around airports for connections as well as cutting out the 2 hour shuttle bus from Sapporo to Niseko. 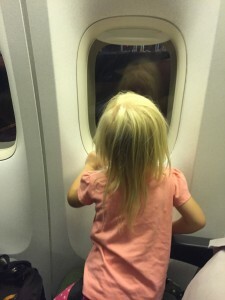 We have a wriggly toddler who is not the best at waiting around at airports and on buses so this really appealed to us. 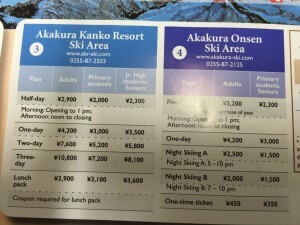 We have skied in Niseko before so can compare the two areas. The area has a reputation for being a good destination for deep powder and lots of it. Sadly, we hit a particularly poor snow season and we experienced twigs sticking out where they shouldn’t and not much powder. In an ideal world it would be nice to book last minute plane tickets to go to where the snow is falling abundantly, but unless you are financed by Donald Trump, this can be difficult. 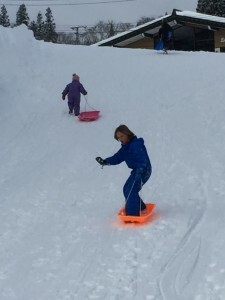 I was sold on the idea of a snow resort where adults could take turns navigating tree runs and powder slopes while the kids could navigate child-friendly runs and all meet at the bottom of the runs and live happily ever after. See the above point regarding snow conditions. There is potential at this resort for powder skiers to go one direction and snow plowers or beginner/intermediates to go the other way and all meet at the base to do it again. This a a skier and snowboarder mountain. For non-snow sports people there are much better resorts in Canada and USA to go tubing, horse riding, sledding, skidoo riding and everything else in between. You would be bored if you don’t like skiing or snowboarding here unless you bring a good book. I was told this resort didn’t attract hordes of Aussies like you see in Hirafu (Niseko) or Hakuba , but sadly the hordes have found Myoko too. Sure, there was more room on the slopes, but at night every restaurant and cafe was full. We made bookings for every night of our stay, Weekends were especially booked up. All holiday-makers want the same thing (traditional Japanese experience and a great snow at great prices) but it’s a full town now. I boarded a shuttle bus at a nearby connecting resort at 4pm and the shuttle bus was packed with Aussies. We stood in the bus aisle for 40 minutes squeezed in between skiers, all clutching children and skis, lurching at every corner. It was the longest ride home and I felt completely ill.
Let’s talk traditional Japanese towns for a minute. At this juncture it’s relevant to mention I have a degree in Japanese language and have spent over 64 weeks of my life living, working or studying in Japan. Let’s just say, I’ve experienced a few Japanese towns. Myoko is an onsen town and 2016 celebrates 100 years of Myoko as a traditional place for Japanese folk to come and bathe in mineral-rich natural springs while resting and recouping strength. Geologically speaking, Japan lies on a fault line that runs through the centre of the country, if you’ve experienced an earthquake or two, I’d be betting you were be in Japan. Every cloud has a silver lining, and the Japanese Alps (AKA the high peaks we like to ski) are the result. Deep underground boiling hot waters run up from the inside of the earth bringing with it minerals such as magnesium, sulphur, iron and other minerals beneficial to the body. There are truly gorgeous and picturesque towns peppered throughout Japan, Kamakura, Takayama and Kyoto are three of my all time favourites. Japan does beautiful and ancient towns well, utilising solid timber in construction and spectacular gardens reflecting nature and specialised trades. It’s a little like Australian beaches, once you’ve been to a few beautiful Japanese towns you become VERY FUSSY. So Myoko? It’s ok, it’s fairly run down and in desperate need of a refurb. If it’s beautiful Japanese town you’re after WITH skiing (for the fussies) try Nozawa Onsen. Now that’s a story for another day. Stay tuned for my next post. You bet I’m fussy. We lug 3 kids and a billion items of luggage around and spend plenty-penny in the quest for a good time, good conditions, good company and good snow. Some families go waterskiing or some women spend thousands on fancy handbags. This is what WE do. We’ve visited over 20 international snow resorts in the past decade and I write content for a domestic snow resort. I’m not a high maintenance gal by an account but I know what I want in a resort. See my earlier post about getting here in this section . In a nutshell, it’s pretty easy to catch a shinkansen (fast bullet train) from Tokyo and it’s reasonably easy to navigate Tokyo. Don’t be too proud to ask for directions, everyone loves practice their English on you. They consider it a genuine project and may even lead you personally to the appropriate train platform. If you’re rolling in cash the best bet is a Chuo taxi. It picks you up at the airport and transports you on the tomei (toll highway) to your destination hotel. It is approximately A$100 per person one way. If you’re ok with the price and it circumnavigates concerns about internal travel in Japan, this option is worry-free. I initially booked a Chuo taxi (shuttle bus) by calling the phone number via Skype that I found online but I can’t tell you whether they spoke English or not, as I booked in Japanese. I cancelled due to price, we prefered the Shinkansen price. The vocabulary you need is endless, I have added other sentences you can use in my other posts. When in doubt use google translate or but a Japanese language CD and learn some basics when you’re driving around pre-trip. 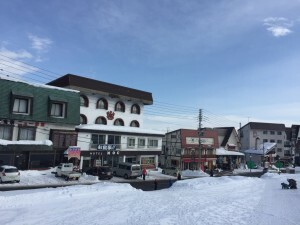 Myoko town is largely on a T-configuration with roads and alleys running off the T. Take care, accommodation can be 2 minutes from chairlifts or 20 minutes walk. It can be the difference between a great trip or a hassle. Do your homework. We stayed 100 steps from the ‘snap skis on’ point where we could comfortably ski down to the ticket office. My husband called that ‘ski in-ski out’ because he’d stayed in the hotel previously on a boys trip. The perspective soon changed when we had a toddler to carry. In 100 steps carrying 2 sets of skis it was back strain, sweat and puffing. A lady staying at accommodation even further was struggling with her two kids. 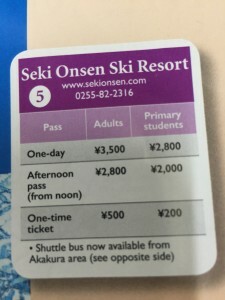 These things count for logistics.See my post on Niseko for a super-easy logistics trip. The mountain range, or Kogen (pronounced kor-gen) consists of 4 resorts accessible to each other via a shuttle bus service. From left to right is Suginohara, Ikenotaira, Akakura Kanko, Akakura Onsen and Seki. All have pros and cons and cater for different abilities. We were based at Myoko for 2 weeks, due to poor snow conditions we got good at checking out other resorts to stave off boredom. In addition to these 4 we visited others accessible by car, shuttle buses, taxis or private guides. These were Madarao, Nozawa Onsen and Tangram. More on these to follow. Myoko resort is split down the middle between Kanko and Onsen. 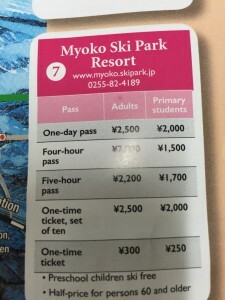 You can buy a ticket for both resorts or buy a ticket for just one resort but you will be restricted to skiing on just that side. They are owned by different companies thus the ticketing discrepency. I was surprised to see Myoko had so many eating options. The T-formation of the town teems with restaurants, cafes, burger places and little bars squeezed side by side in between souvenir stores and old hotels. We didn’t have a bad meal, food wise. Service varied from great to slow. At a pizza eatery we waited an hour and a half between ordering and eating. It was a husband and wife team, they desperately needed more staff to fill demand. Given that we had a two year old desperate to eat it became a little stressful. Our best meal was at a tiny traditional eatery that didn’t even have a name sign, merely a couple of red lanterns out the front advertising main meals. 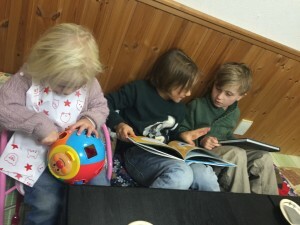 The husband and wife team supplied our kids with books while they waited and gifted them with toys, special kids items and a lucky dip including a large Kendama (traditional and popular Japanese toy). In between cooking and serving food they played with the kids, we have fond and special memories from there. Our hotel meal was one of our highlights. 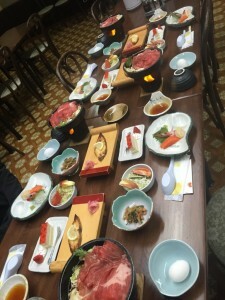 It consisted of lots of little local delicacies and the kids really got a kick out of experiencing hot and cold dishes all delicately placed and very pretty. 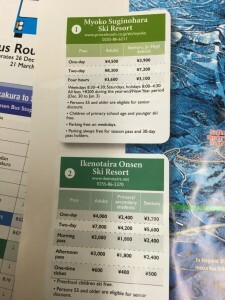 Undeniably, Japanese resort lift prices were good. The skier or snow boarder that got the best out of the experience was the intermediate. Advanced/ powder skiers were frustrated on our trip with those conditions. 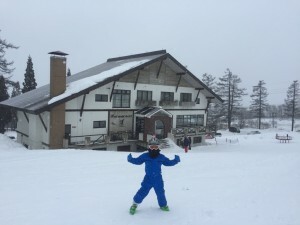 Beginner were limited to a few areas at the Myoko resort itself unless progress was swift. Adjacent resorts of Ikenotaira and Suginohara were good for beginners with broad, long runs. 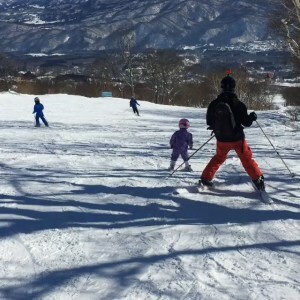 It was nice to take time skiing as a family. 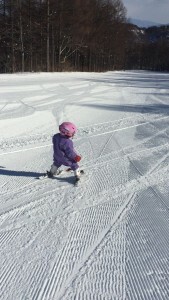 Our youngest learnt to ski independently and learnt to traverse and stop and turn all in the first week. By week two we skied at a few different resorts taking turns skiing with her while the other adult took the boys on other runs. Skiing as a family is fantastic. Lift ticket costs vary depending on full day, morning, afternoon or child pass. 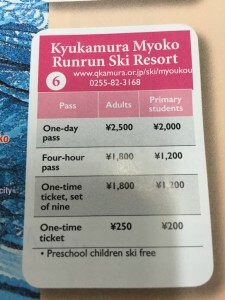 We found out buying tickets at Myoko Snow Sports office was the best value on the mountain. 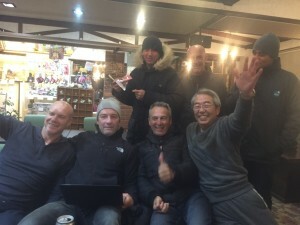 We had been given the thumbs up on Myoko Snow Sports prior to our trip. 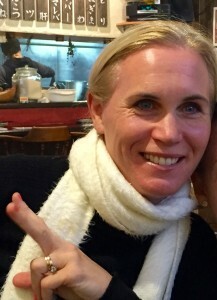 This thumbs up was due to excellent service. Tom who owns Myoko Snow Sports runs it well. 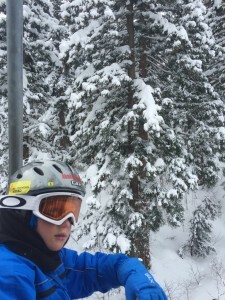 Confirming excellent reports, the snow sports school was flexible with little skiers, prices, times and very customer-centric. I would definitely recommend them for kids. Let’s talk about Seki here. Seki is the advanced snow resort, geographically positioned well attracting deep powder. Steep slopes attract customers in search of these conditions. Prior to 2014, Seki-devotees were powder hounds, but lately Seki has been attracting a plethora of multi-ability skiers. One local has never seen seek as crowded as January 2016. 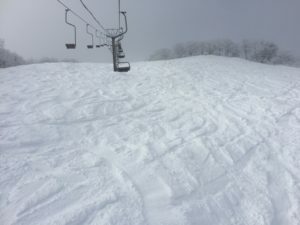 The problem is Se ki is a privately and family owned basic resort consisting of just two chairlifts, neither of which have safety bars holding skiers/ boarders safely onto chairs. What happened the day we were there is a typical safety story for Seki. Once off the lift there are two ways to get down the mountain, the mountain face and the cliff face. We traversed the mountain face then deliberately navigated the cliff face, anticipating more powdery ‘pillows’ in the crevasses. 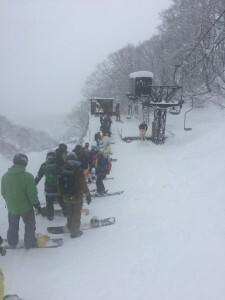 Instead we found a 20 year old female Australian skier, shivering and crying, left by her group at the top of the cliff at this completely unpatrolled Japanese resort. My husband and I earned our Austrian Anverter ski instructor qualification, so we felt capable enough to guide her down the cliff face. She lost her confidence and largely slid vertically until she met with the bottom of the mountain. This is a typical story, more and more young Aussies are falling prey to accidents like this and there’s nothing stopping intermediate inexperienced skiers or boarders coming to try their hand and getting STUCK. If I had a young adult son or daughter I would discourage them to come to Seki. Check out the photos of the queue waiting for the 2nd lift (higher) to open. Queues for both chairlifts were up to an hour long. Holy Mackerel! 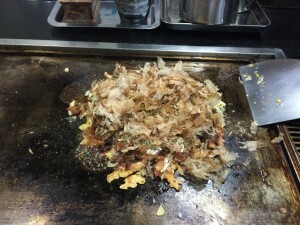 The crazy thing was …..Seki was my BEST day out of our two week trip. Luckily, my husband is pretty safety conscious and refused to let our kids come, or anyone else (including me) until he’d done a reconnaissance trip. He’d skied at Seki in 2014 as well. We had our strategies in place for how we wanted to attack Seki. But it’s NOT a place for intermediates to try their hand. If you fall down a cliff there’s limited rescue options. It’s a well known joke that between 1pm and 2pm the lifties go to lunch and leave skiers and boarders to load themselves on and off. Could I spend a week at Seki? No way, one day was plenty. It’s a tiny place and it gets skied out. Ever the restless traveller we’ve booked next year’s trip for somewhere else. It would be nice to experience Myoko with snow on it again some day but we won’t be back next year. When the Australian dollar recovers we are super-keen to return to Jackson Hole, Snowbird and Aspen Highlands. And my ‘one day’ resort is Telluride. It was a ski brochure on the Dolomites (Italy) that first stirred Emma's interest in all things ski-related. That endless white moonscape, skiable as far as the eye can see... those geological wonderments. All those hot gluhwein drinks! 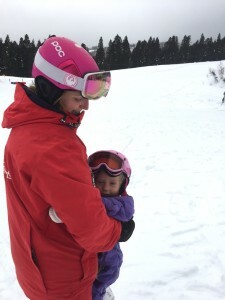 Promptly quitting her Japanese language teaching job Emma hot-footed it to Austria to become a a ski-instructor, got engaged and did a season alternating between consuming chicken schnitzels and demonstrating the 'alpine position' to English ski students. 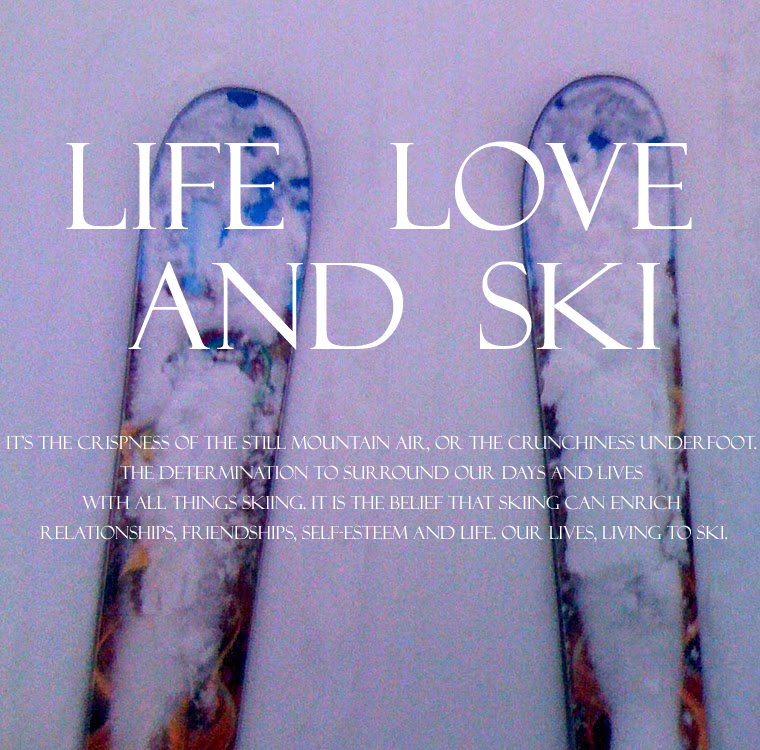 Whist still not fulfilling her Dolomite ski fantasy, Emma happily lives and breathes her passion, albeit through writing and finds North America and Japan great snow resorts to share with her young family. Particularly the buffalo wings and the okonomiyaki. Hi Emma, thanks for the great write up. Glad you had a good time. Can I please point out that in general you are talking about AKAKURA ONSEN, not MYOKO. Akakura Onsen is a village within the old Myoko Kogen town region. Several years ago it merged with Arai and Myoko Village to for Myoko City. So when you say Myoko you are actually referring to the city area about 30 minutes drive away. Increasingly we are seeing travellers get confused and get off at the wrong station (such as JoetsuMyoko) and wondering where the lifts are, or booking hotels in the Myoko City area. So just wanted to clarify that for interested readers. Thanks! Also it was good to point out re the travails of staying ski in, ski out.